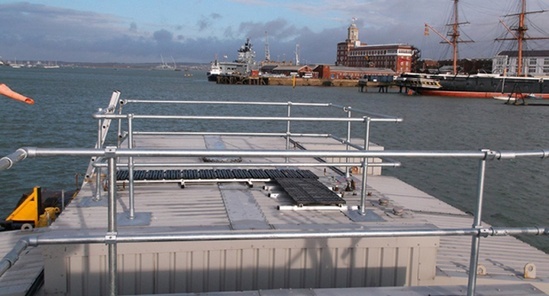 KeeGuard® Topfix edge protection and Kee Walk® walkway were installed by Safesite for Wightlink Ferries on their refuelling tanks moored in Portsmouth Harbour to allow safe access to the sounding caps and level sensors on top of the tanks. 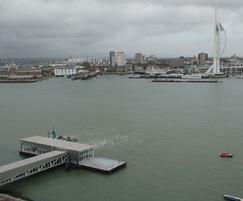 Wightlink catamarans and ferries are the main link between the Isle of Wight and mainland UK, with nearly 50,000 sailings per year. Refuelling for the vessels is carried out via specially designed floating oil and gas platforms which are moored in the harbour. 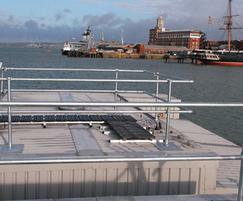 These platforms allow the vessels to refuel as and when needed without disrupting the daily services. Wightlink asked Safesite to carry out a survey and recommend the most appropriate solution to allow safe access onto the tops of the tanks for the sounding caps and level sensors which are used to monitor the tank fuel levels. KeeGuard® Topfix is designed specifically to provide collective edge protection for metal profile roofs and allows safe access onto both tanks. 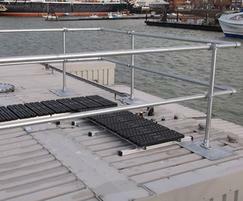 The Kee Walk® anti-slip walkway provides a level walking surface to the sounding caps and level sensors.